After our diocesan consultations in 2015, we identified pastoral challenges and the needs of our diocese. It is now time to come up with a pastoral response. I have identified Renew Africa as a possible pastoral programme to answer of the needs of the diocese. The main of Renew, is to assist parishes in the establishment of Small Christian Communities. These communities are encouraged to develop as communities of prayer, faith-sharing and action (mission). In Renew you find SHARING, TEACHING AND WITNESSING. Renew provides practical means of evangelization. Faith becomes a source of inspiration to do something. Their five pillars are: SHARING, MISSION, MUTUAL SUPPORT, LEARNING AND PRAYER. RENEW emphasizes the training/formation of leaders and facilitators. Once you accept Renew in the diocese, you have to spend almost a year training different committees: eg Liturgy committee, Hospitality committee, SCC leaders and facilitators, etc. Our parishes will be expected to form a Renew Parish Core Community which will oversee all the activities of Renew in the parish and they too will need some formation/training. It is a Renew rule that you may not Launch Renew Africa officially if the people are not trained. Renew will demand of us, especially the priest and the PPC to identify people in the parish, who are not overly committed, but who have SKILLS to animate, facilitate and organize. People of faith. They are the people who can form the Parish Core Community. I would like to ask our parishes to inform the Deanery pastoral council how they feel about this. Renew was presented to the clergy and to our Diocesan lay leaders. We need to general buy-in of our parishes because once we accept Renew, it cannot be business as usual in parishes. We will have to prioritize Renew over all our parish programmes. Should we go ahead with Renew or not? The Bishops’ Conference is sending out a message, warning our families and our churches about the humiliating discipline of children. The Department of Social Development says that it is a crime to assault a child. You are not allowed to hit or spank a child. Social Development is making amendments to the Children’s Act of 2005. It will go to parliament. They want to make sure that corporal punishment of children is outlawed. Corporal punishment at home and in the church is going to be declared a violation of children’s rights. It is regarded as an infringement of the child’s dignity. It is said not to be for the best upbringing of a child. Freedom and Security in our constitution is for everybody, including children. It must be safeguarded in public and private spaces. The other alternative forms of discipline are encouraged. If you are caught, then you will be sent for counselling and for parenting skills. It was observed that some people harm children in the name of discipline. We are a violent society. Spanking, physical abuse leads to rebellion, anger, depression, fear and cognitive disabilities, etc. We are asked to learn POSITIVE DISCIPLINE which is without violence and can lead to positive behaviour. Children want love, respect and consistency. As we move towards elections, let us pray for peaceful elections. Let our Justice and Peace help us to offer enough Election Observers for these elections. Let us lower our tempers. We must avoid violence and unnecessary conflicts. Let us continue to educate our voters. They must exercise their right to vote. They must vote without fear. Let us have realistic expectations from our parties and elected members. Elect people who are honest, reliable, committed to their work, ready to sacrifice, accountable and passionate. Elect leaders who care and who are compassionate. The SACBC will be sending out a Pastoral Letter on elections very soon. A prayer for elections will be sent soon. We will have our Parish Pastoral Council elections towards the end of 2017. All the parishes, sodalities and movements will be expected to elect new members. By the end of June 2017, I will send out guidelines on those elections. We will also give guidelines on the formation of Parish Finance Committees and how they are to be constituted. At the moment, we ask you to work together, priests and lay leaders, putting the good of the parish ahead of our own self-interests. I repeat my call from the last letter, when I called for collaborative leadership where the priest and the lay leaders respect each other and work harmoniously for the spiritual growth of the parish and the development of parishioners. Let us bring back the values of mutual respect, prayer, sharing, accountability and transparency. 5. I thank all the priests and leaders for sending your Holy Childhood, Lenten Appeal and your Good Friday collection. 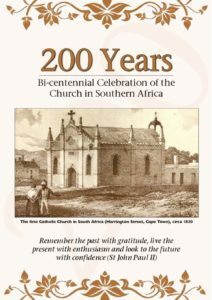 Fr Lebohang Malemoha, OMI., will send out a list of all the contributing parishes and those who are still lagging behind. During the month of June, make a special collection for the pope. It is called Peter’s Pence and it will be sent to the Apostolic Nuncio via our chancery. His Holiness, Pope Francis will use the money for the upkeep of the Vatican State and for papal charities. We thank you for taking the call for financial accountability seriously. Let us also work hard to become more and more self-supporting and self-reliant diocese. Be generous in your giving. 6. We are busy negotiating with Oblate Farm owners on the possibility of purchasing a portion of their land for the diocese. We are interested in the Oblate chapel and the buildings around it. We believe that those houses can be renovated and used to make some income for the diocese. Our negotiations are going on well and we hope to conclude this matter soon. I will invite Men’s Forum and Women’s forum to assist our Property Committee on the issue of Oblate Farm and how we can develop it. 7. Let us continue with our efforts on the Year of Mercy. We congratulate Deacon Masibi who managed to raise enough money to attend Jubilee of Mercy for Deacons and Priests. May he come back with many graces and blessings to share with us. 8. AMORIS LAETITIA is the Post Apostolic Exhortation of Pope Francis and the JOY OF LOVE. It is very good and I would like to recommend our attachment from Archbishop William Slattery OFM, who summarized it so well for us. You can download the whole Exhortation from the Vatican Website. 9. I encourage our youth and parish ASB to be part of the Youth Day at St Ephraim on the 16th of June. Cooperate with Fr Oupa Kgage and Fr Tsoaeli Ledimo and their team in the preparations for this day. Once more I call for good behaviour and discipline. 10. After consulting our Vicar General I decided to appoint Fr Melusi Hlatshwayo as Dean of Wolmaranstad. I call upon the whole deanery to cooperate with him and to give him the support he deserves. This deanery has great potential and we will support you too in your endeavours. 11. I know that our Altar Servers and the Youth have completed their deanery elections. We will announce a date for the meeting of our Deanery executives to elect their diocesan committees. THANKS FOR YOUR COOPERATION. Continue to serve the Lord. 12. I had wonderful encounters with Lay Ministers and Catechists of Potch Deanery and Ditsobotla Deaneries. I learnt a lot from those encounters and I will have something to say after my meeting with the other deaneries. Continue to serve the Lord with love. 13. I would like to request our deans to make sure that every deanery has a priest catechetical chaplain and a deanery catechetical committee. The priest make take care of the catechesis in his deanery and make sure that formation takes place, resources are available and catechists are supported. This is an urgent matter and I need to get some feed back as soon as possible. 14. We will announce very soon the date for the first meeting with candidates for Diaconate training. It will be in July. 15. RECOLLECTION FOR THE CLERGY: In June we ask all the clergy to hold their recollections on the deanery level. 16. July 12 – Clergy Study Day. July 13 – Recollection by Fr Jonathan Shand. I will be travelling and during this time, I leave the whole responsibility in the hands of our Vicar General, Fr Donaat Bohe, OMI.